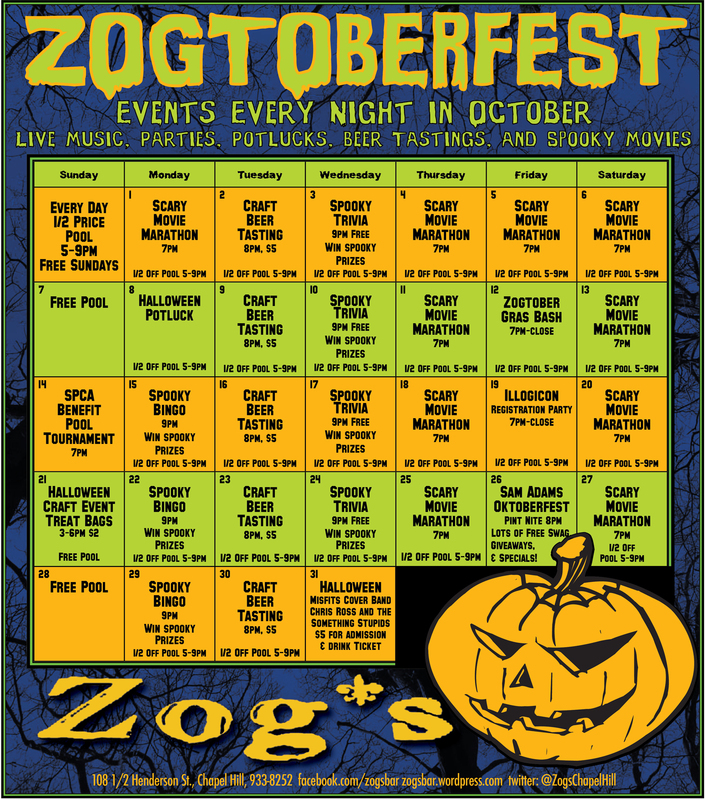 Second Annual Zogtoberfest! Free crap! Trivia! Bingo! Beer Tastings! Theme Parties! Live Music! Potlucks! 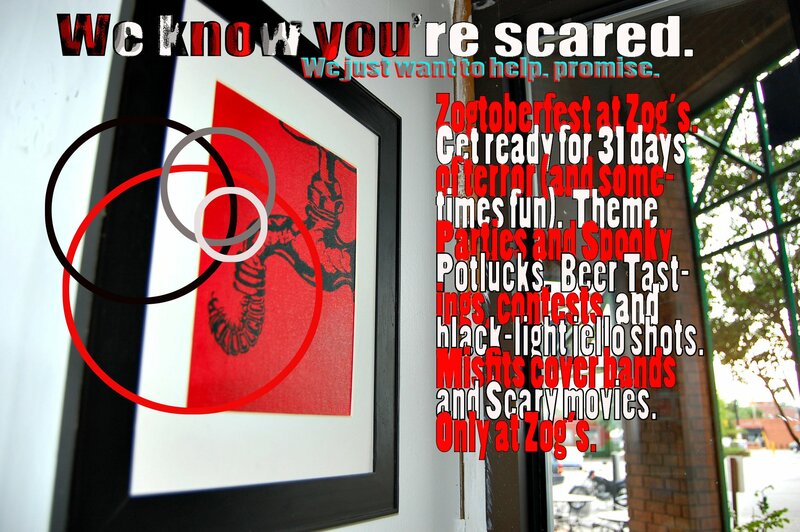 We’ve jam-packed October with more events than you can handle. See how many you can conquer. MOST EVENTS ARE FREE. 31 HALLOWEEN PROPER. Live music with Snowship and Live Misfits set from Chris Ross and the Something Stupids. ; 9pm-close; $5 gets you admission and a drink ticket. FREE FOR MEMBERS. 1 MONTH. 1 BAR. 31 EVENTS. Every night in October is rockin’. Live Bands! Talent Show! Beer Tastings! Cook-off Contest! Mandey’s Birthday Party! Spooky Bingo & Trivia with weird prizes! Free Pool & Scary Movies on the big screen every Sunday! Here’s the schedule so far. You can RSVP to this whole event no matter what you’re attending. Mon, Oct 3, 9pm: Spooky BINGO! Win cool prizes! Wed, Oct 5, 11pm: TRIVIA with Dave! Win prizes! Sat., Oct 8: LIVE MUSIC by Spiralfire! Mon, Oct 10, 9pm: Spooky BINGO! Win cool prizes! Wed, Oct 12, 11pm: TRIVIA with Dave! Win prizes! 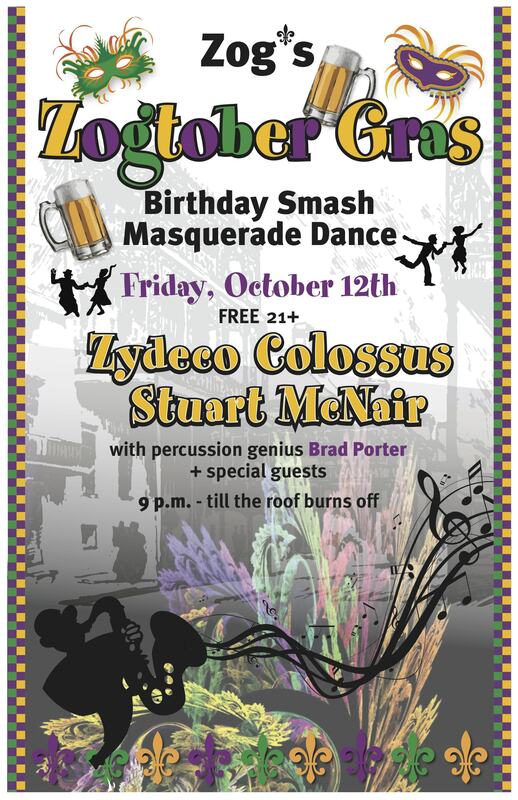 Sat., Oct 15, 7-10pm: LIVE MUSIC by The Fooligans (at 10)! Abita Pecan Harvest COOK-OFF CONTEST (at 7)! Wed, Oct 19, 11pm: TRIVIA with Dave! Win prizes! Mon, Oct 24, 9pm: Spooky BINGO! Win cool prizes! Wed, Oct 26, 11pm: TRIVIA with Dave! Win prizes! Sat, Oct 29: SILS COSTUME PARTY! Sun, Oct 30, 2pm-7pm: Pumpkin Carving, Kids welcome! *Note: there are limited spaces for the beer tastings. Please see a bartender to sign up and pay in advance. good times. great friends. no snobs. zog’s, chapel hill. January for you. All for you. Feliz Navizog, Comrades. New Drinks and Events! September Potluck (and a couple of potluck pics)! Potluck and Live Music, Tuesday 1/18!